The 17th Annual Casas for CASA Playhouse Fundraiser has added a new twist for this year’s playhouses. For the first time ever, YOU get the opportunity to choose the TWO playhouses that will be built at the Home, Lawn, & Remodeling Show on March 16th & 17th at the Decatur Civic Center. 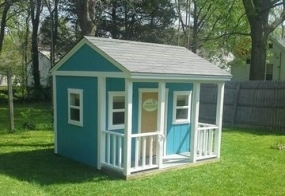 The two playhouses will then be raffled off LIVE at the Greater Decatur Chamber of Commerce Business Expo on Thursday, May 2nd. From NOW until February 15th, voting is live at the Macon County CASA’s Facebook page. Listen to the podcast with Julia Livingston, Jessica Whitlock, Joe Springer & Matthew Brown, CASA.